While you might not consider a refrigerator to be a particularly dangerous item, it is still important to keep in mind that refrigerators can and do cause injury. Possible injuries that can be caused by a refrigerator include bumps and bruises, cuts, pinches, electrical injuries including electrocution and fires, burns from coolant chemicals and coils, poisoning from inhaling coolant chemicals, and even crush injuries. While statistically-speaking, more injuries are caused each year by ovens and stoves than refrigerators, The Consumer Product Safety Commission’s (CPSC) National Electronic Injury Surveillance System (NEISS) estimates that there were more than 7,000 injuries to children under the age of 18 caused by refrigerators that were treated in hospital in the United Stated in 2013. 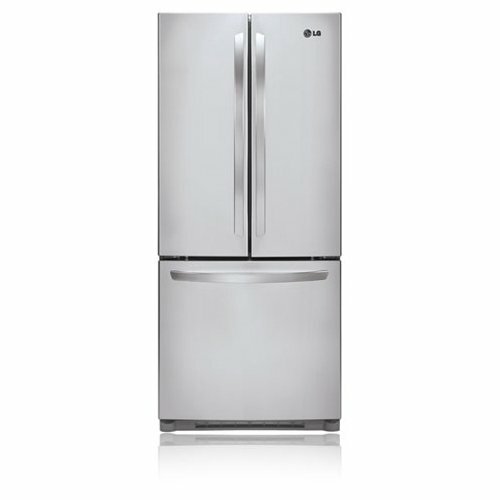 The number of actual injuries caused by refrigerators is likely quite higher than this, as the data from the CPSC only looked at those injuries which resulted in medical treatment at a hospital, and minor injuries were likely treated at home or another medical treatment facility not included in the reporting data. Besides physical injuries caused by falls, pinches and more, it is worth noting that food-borne illnesses can also be directly attributed to improper refrigerator use or function. In fact, the CDC estimates that about 1 in 6 Americans (or 48 million people) get sick, 128,000 are hospitalized, and 3,000 die of foodborne diseases each and every year, which makes ensuring your refrigerator is working properly of the utmost importance. Young children, pregnant women and the elderly are all at increased risk of contracting a food borne illness. With research from the Academy of Nutrition and Dietetics (formerly the American Dietetic Association), finding that only 40% of Americans know eating food stored in a refrigerator with a temperature higher than 40°F increases the risk of food borne illness, more education is also clearly needed. Here are some things to keep in mind when purchasing and using your refrigerator. For the most part, safety standards for refrigerators have been created by a mix of consumer groups, government agencies, producers, retailers, and suppliers and are completely voluntary on the part of manufacturers. Look for a sticker on your refrigerator that tells you it’s been approved by CSA, ASTM, ANSI, UL, CPSC or some other such safety association. Be cautious of purchasing a refrigerator made in China, as regulatory standards are much different there than in the United States. 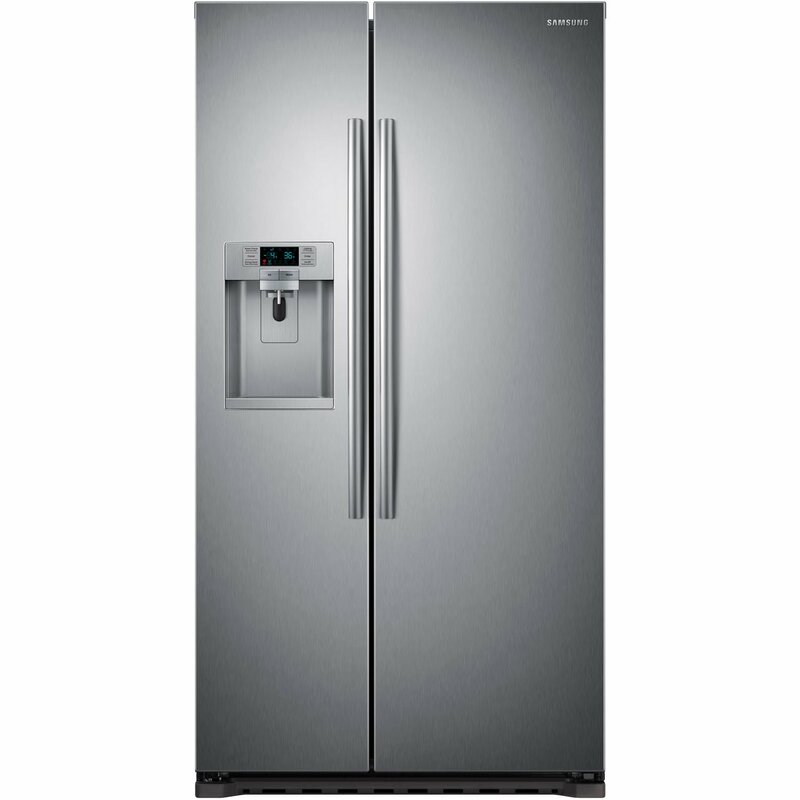 The Refrigerator Safety Act provides a requirement that all refrigerators sold in the USA have the ability to open a door from inside the unit. Other safety features to look for include anti-tip technology, sealed cooling and electrical components, safety glass or shatter-proof glass shelves and shelves that adjust without removing – which can reduce the risk of cuts. 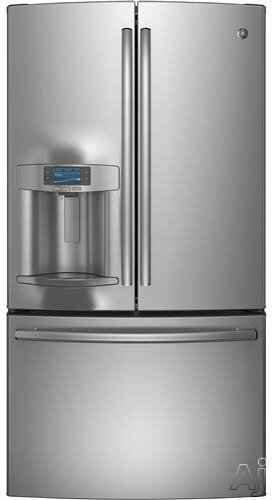 If your refrigerator came with a warranty or registration card, be sure to complete the form and mail it in to the manufacturer. This way, you’ll be notified of any recalls or other safety information in the event of a problem with your model. Surveys done by Consumer Reports National Research Center show that most people seldom or never take this essential safety step. Have a trained professional install your refrigerator and ensure you’ve made allowances for any space or other clearance requirements necessary for safe installation. Your refrigerator should also have its own dedicated spot on your electrical circuit in order to prevent power overloads and other electrical problems. If you have young children in your home, installing aftermarket refrigerator safety products such as an appliance latch or lock can help to keep them safe. Experts recommend storing food in cold temperatures (40°F or below) in order to prevent harmful bacteria from growing. Know that refrigerator temperature can fluctuate depending on the season, so you will want to adjust the controls as necessary to ensure the interior temperature stays at 40°F or below. If your refrigerator does not come with one already installed, look at purchasing an aftermarket refrigerator thermometer in order to ensure your refrigerator is keeping food at a safe temperature. Leave it on the middle shelf and check regularly. Clean up any spills immediately to prevent the growth of bacteria and risk of food borne illness. Always read and follow the manufacturer’s instructions for installation, use and cleaning of your refrigerator, and don’t hesitate to contact them if you should have a question about something specific that isn’t covered in your user manual. Ensure there is adequate ventilation before you begin cleaning your refrigerator. The fumes from many household cleaners can be toxic and make you ill. Ensure any residue from cleaning products is thoroughly removed before you use your refrigerator to store food again. 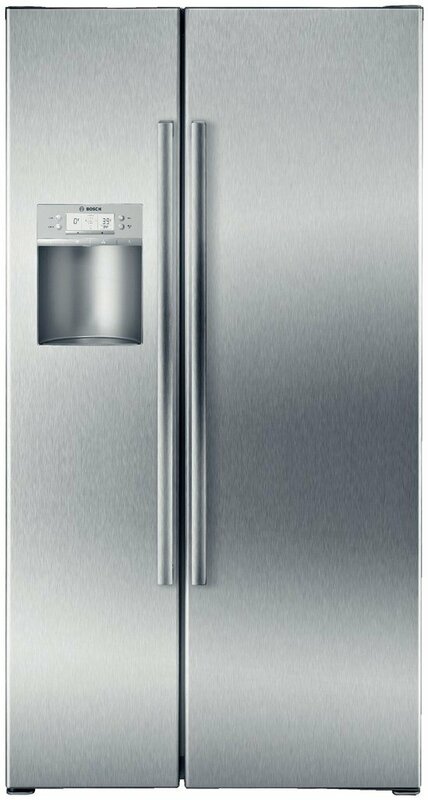 Ensure the refrigerator is turned off before you clean any electrical components or disassemble the ice or water dispenser unit to clean it. You’ll also want to turn off the refrigerator before cleaning the condenser coils (use a brush or vacuum). Make a habit of vacuuming the front grill free to keep it free of dust in order to allow proper airflow to the condenser which will give you the best cooling and efficiency from your unit. In case of a cut, pinch or mild bump, immediately remove yourself from the area and seek first aid treatment when necessary. 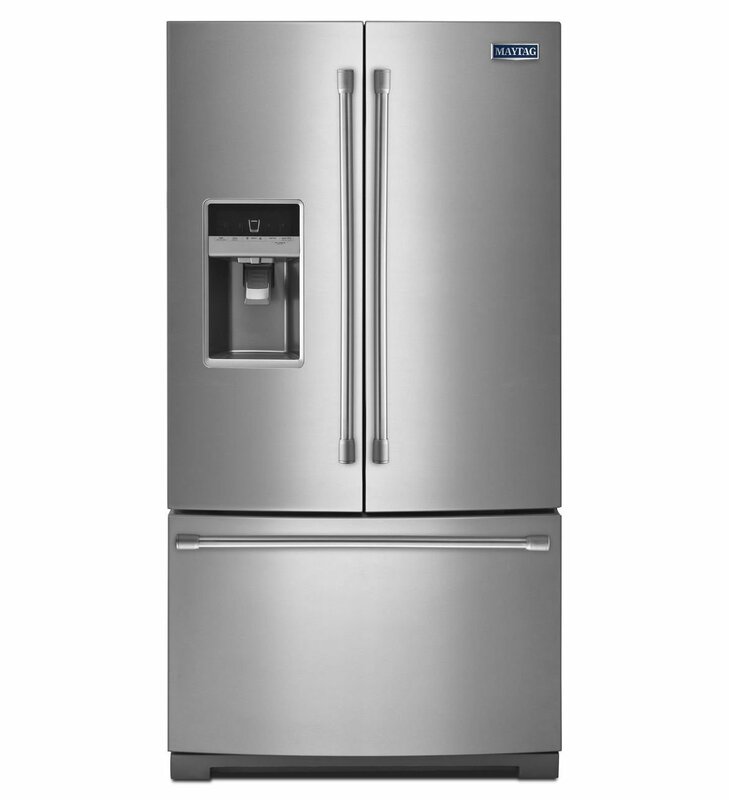 With the above tips in mind, in no particular order, here are 25 of the refrigerators we consider to be the safest, based on available features and average customer reviews and ratings. 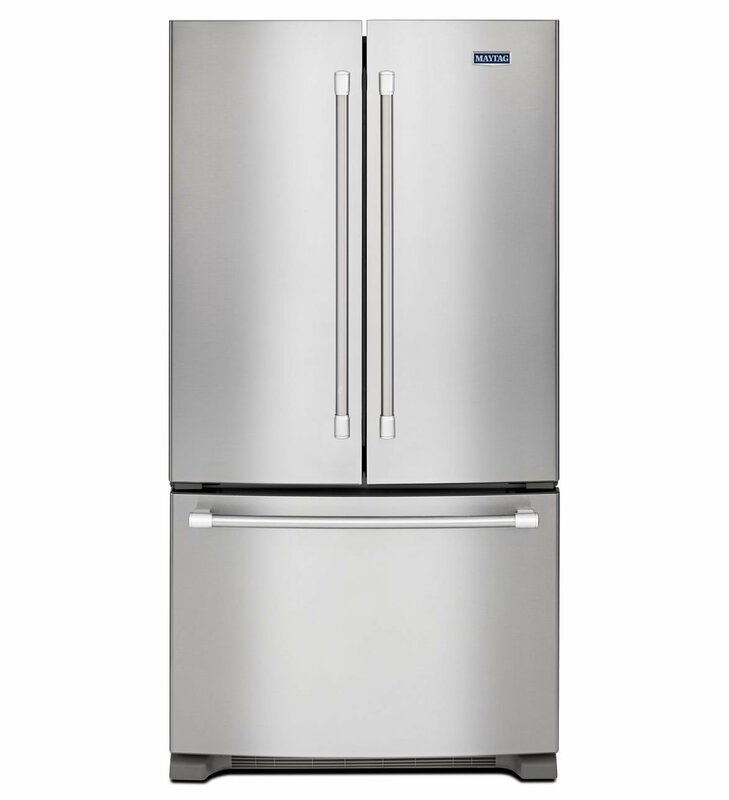 This Energy Star rated side-by-side fridge is counter depth, offering the ultimate in styling giving you a built-in look without sacrificing on storage capacity. And with a built-in wine rank, even the grownups will approve. This side-by-side refrigerator and freezer combo features a sleek, counter-depth design that seamlessly blends in with any kitchen layout. Thanks to its Twin Cooling Plus system, your fruits and vegetables stay fresher longer and frozen foods are less likely to experience freezer burn. 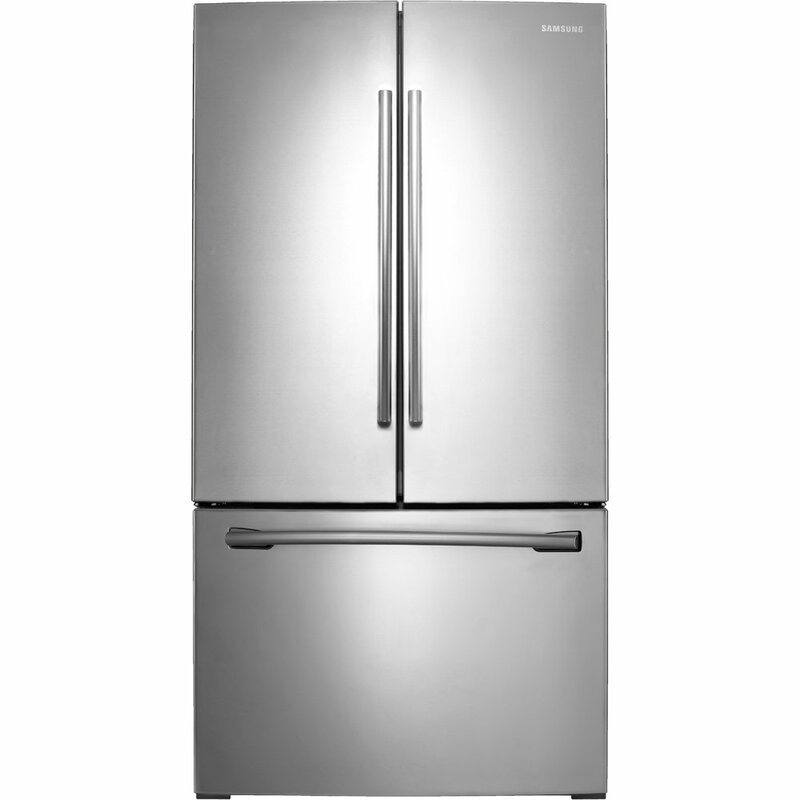 This bottom-freezer refrigerator is tough enough to stand up to nearly any kitchen use and boasts strong stainless steel handles and is Energy Star rated to help save you money. Plus, it’s engineered and assembled in the USA, so you can trust the quality that goes into it. This compact refrigerator is an ideal cooling solution for basements, apartments and even garages thanks to its small size. It’s Energy Star rated so it won’t cost you an arm and a leg to run either and its high-tech mechanical thermostat ensures your food is always kept at the right temperature. 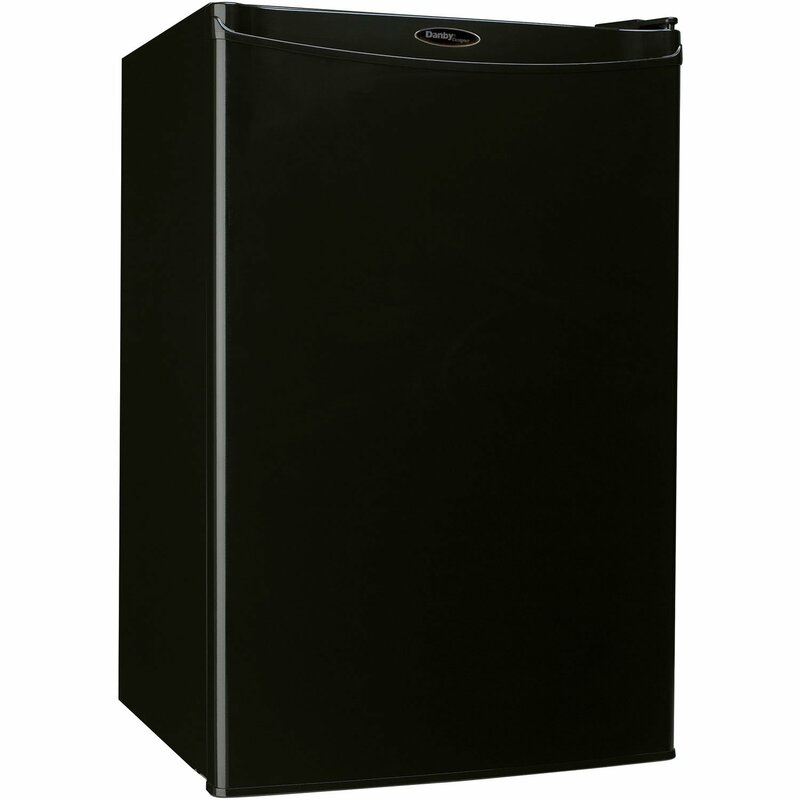 This Energy Star compliant compact refrigerator is an ideal solution for offices, garages, dens and more. With a reversible door, you can get the opening on the side you want and wire shelving gives the ultimate in storage options. 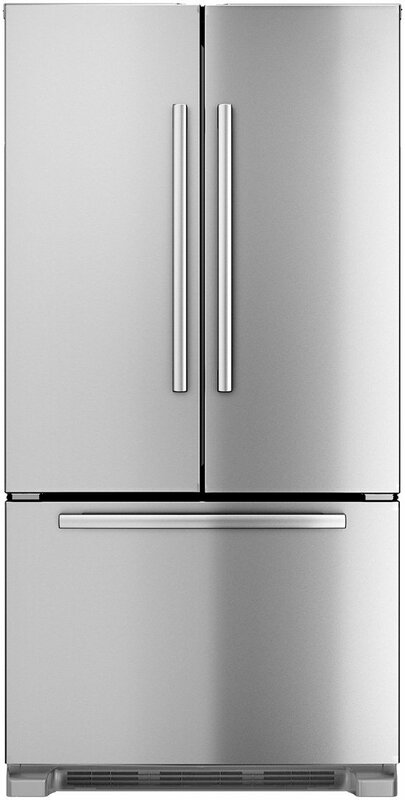 Available in three color choices to suit your kitchen decor, this full-size refrigerator boasts a bright interior light and reversible door to suit your kitchen layout. Thanks to a separate produce door, your fruits and vegetables will stay fresher, longer. 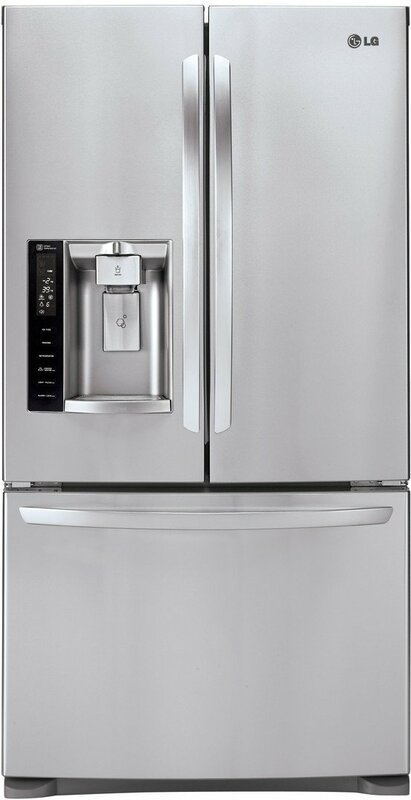 This French door refrigerator comes complete with spill-proof glass shelves and a filtered water and ice dispenser. Food stays fresher longer thanks to the brand’s VitaFresh food preservation system. With 26 cubic feet of storage, it can handle nearly anything your family puts in it. This large-capacity side-by-side refrigerator and freezer combo boasts an external filtered water and ice dispenser, and two produce doors that keep your fruits and vegetables fresher longer. 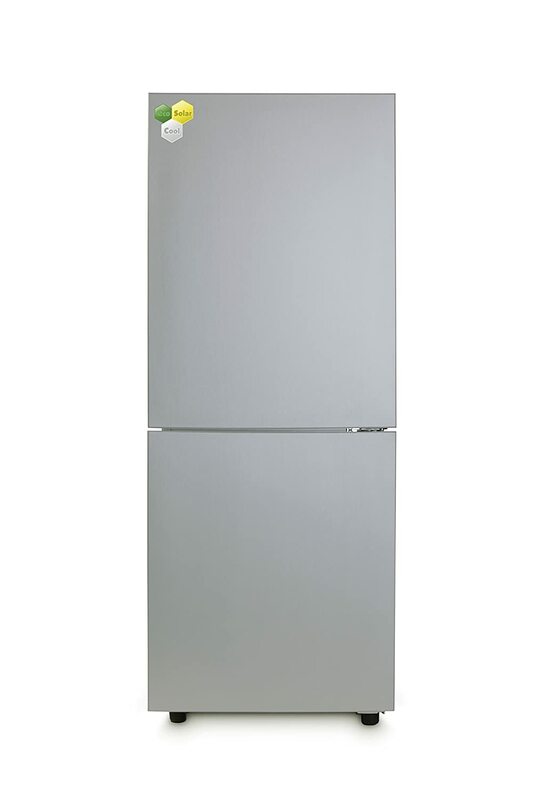 This French door refrigerator boasts a whopping 25 cubic feet of storage space and features strong stainless steel handles and is Energy Star rated to help save on your electric bills. Plus, it’s engineered and assembled in the USA, so you can trust the quality that goes into it. 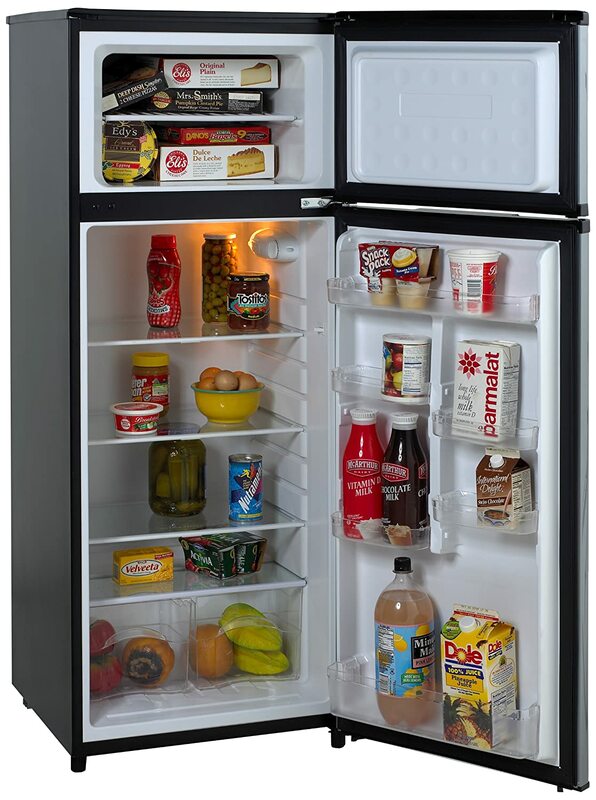 This Energy Star rated two-door refrigerator is perfect for small spaces like basements and apartments, and boasts fully adjustable and removable glass shelves and door bins. 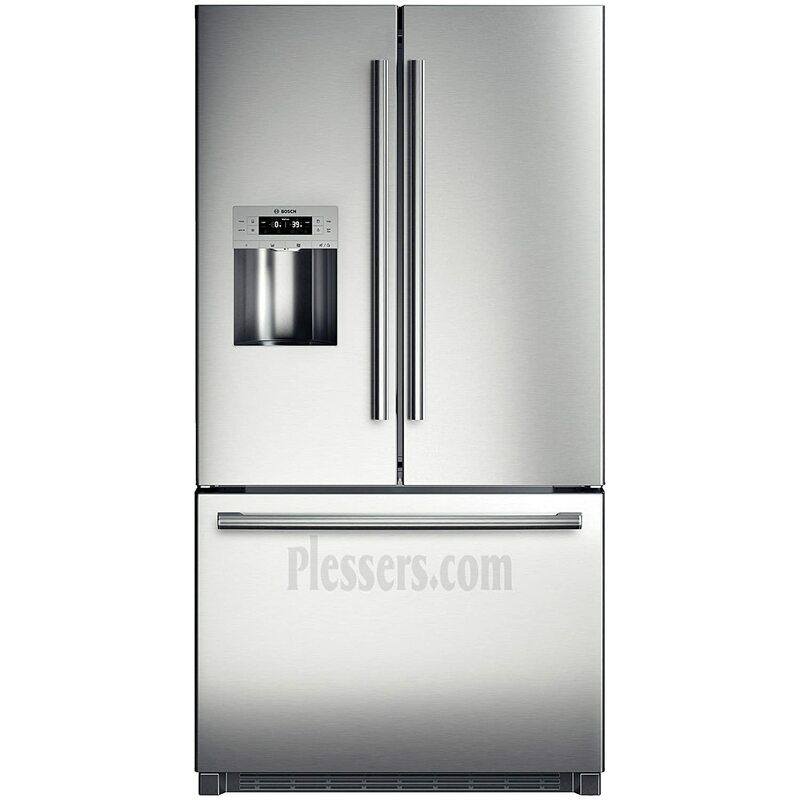 This French-door refrigerator with bottom freezer features spacious storage with a sleek design. Thanks to its Twin-Cooling System, your fruits and vegetables will stay fresher longer and an automatic ice maker filters water to give you fresh ice when you want it. 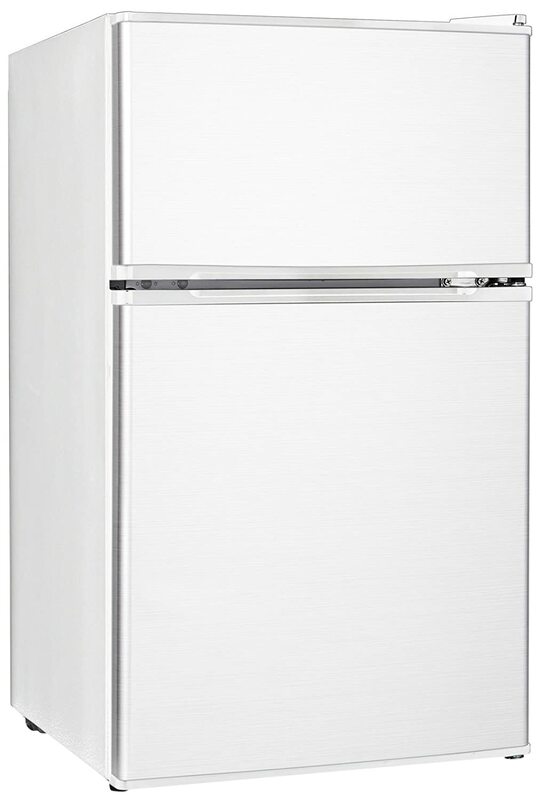 The ideal single-serve refrigerator, this compact unit features a single, reversible door and operates with low noise so you won’t even know it’s there. A separate chiller compartment ensures your favorite foods stay nice and cold. This highly energy efficient refrigerator can be run on solar power, with no adaptor or convertor necessary. 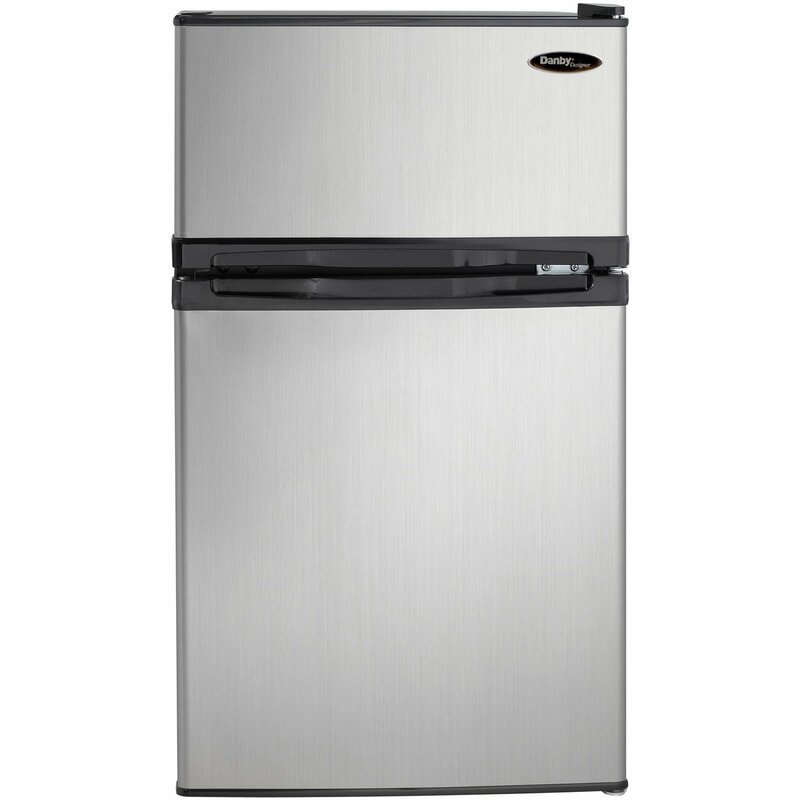 It has a fridge unit on top and freezer compartments on the bottom that are large enough for all your cooling needs. 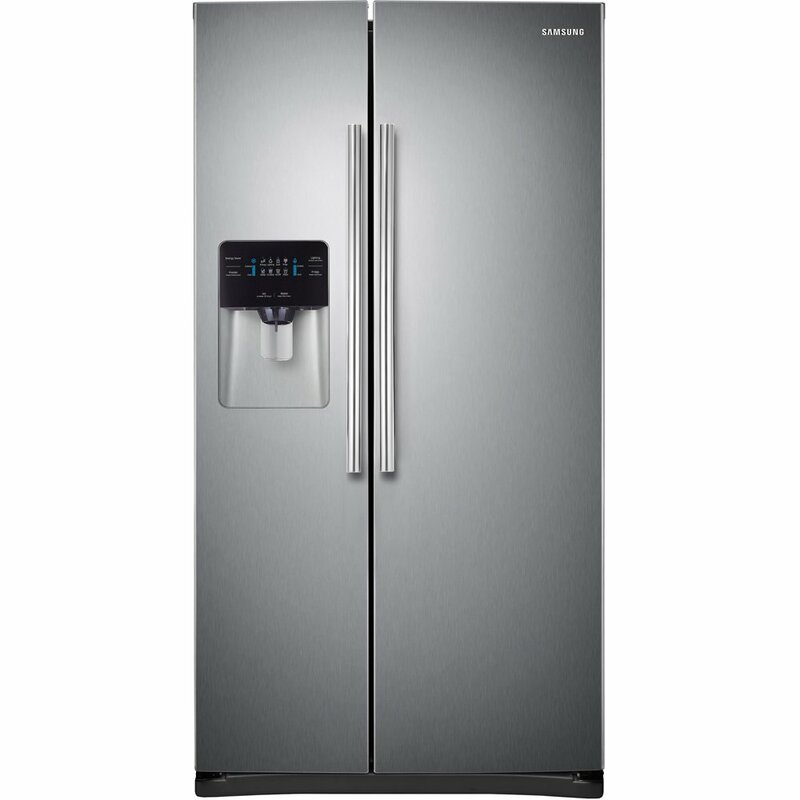 With French doors and an ultra-large capacity, this refrigerator is a perfect choice for larger families and even boasts an in-door automatic ice and water dispenser with built-in filtration system. 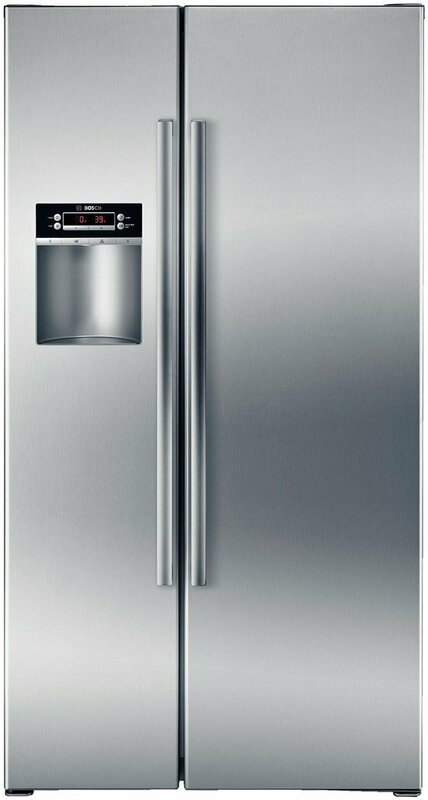 This refrigerator with bottom unit boasts a number of smart features that make it incredibly energy efficient. With a built-in icemaker and interior freezer fan, you can rest easy knowing your frozen foods are kept at an ideal and safe temperature. 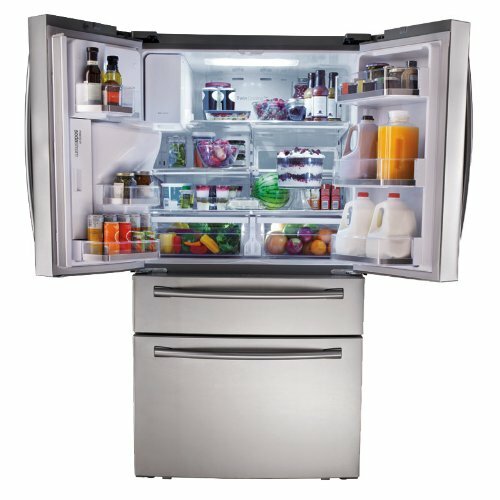 This ultra high-capacity French door refrigerator offers so much space for storing and cooling your family’s groceries. 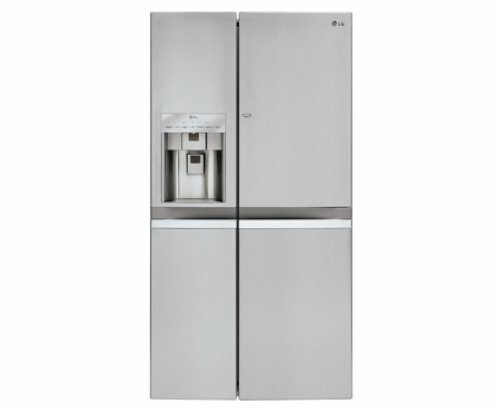 A built-in automatic sparkling water dispenser offers the ultimate in luxury and the digital temperature controls are easy to read and use. 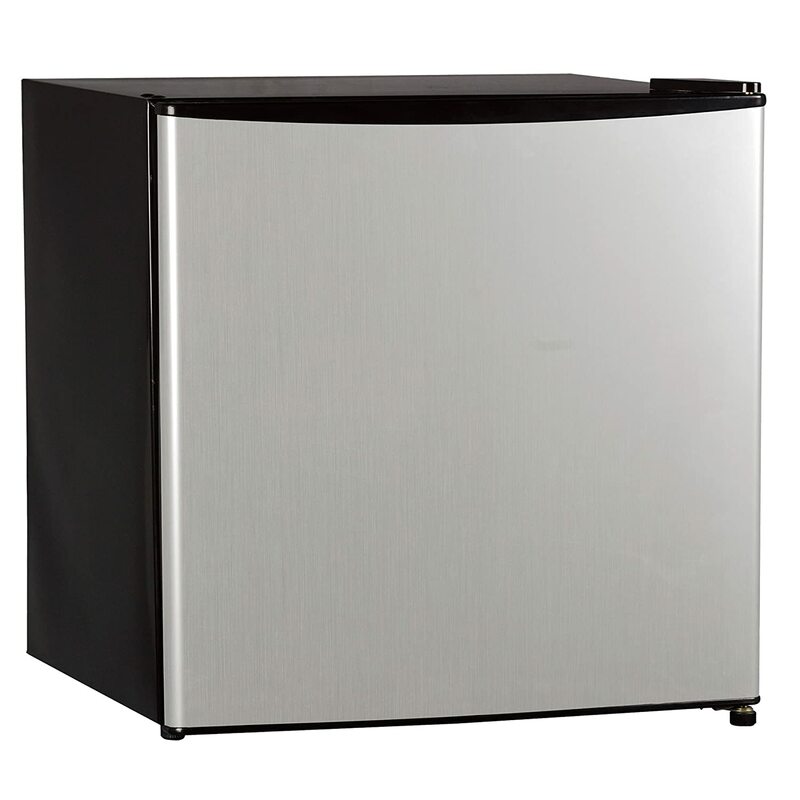 This mid-size refrigerator is an ideal choice for tight spaces while still offering a decent amount of storage space in both the fridge and freezer sections of the unit. With its spotless steel door finish, you get the look of stainless steel without the smudges and for less cost. With more than 21 cubic feet of storage space, this French door refrigerator features bright LED interior lights for easier viewing and energy savings. Electronic controls allow for precise temperature control and a door open alarm lets you know when you’re letting all that cold air out. 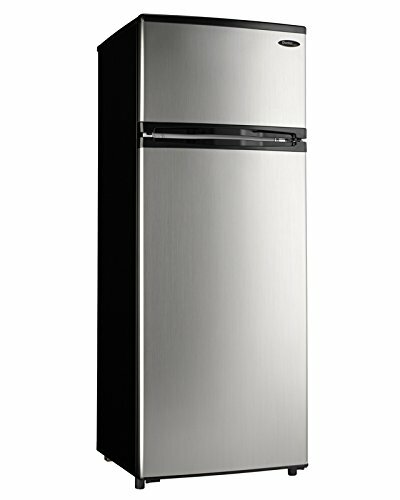 This side-by-side fridge and freezer combo offers the ultimate in modern styling and features a door-in-door design that gives you easy access to the items you use most. Plus, with 22 cubic feet of capacity, it can hold nearly anything your family can put in it. This side-by-side refrigerator and freezer combo features a door-in-door that allows you to reach your most favorite items faster and easier. Thanks to its stainless steel panelling, it helps to keep food colder better, reducing energy costs in the process. 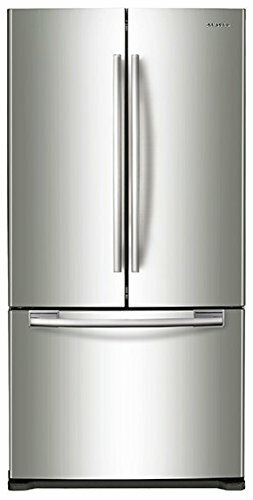 This ultra quiet refrigerator boast nearly 20 cubic feet of storage capacity and is Energy Star rated to help save your family money. With bright interior lights and hidden hinges, safety is at your fingertips. Electronic temperature controls allow you to ensure foods are kept at ideal temperatures. This Energy Star rated side-by-side refrigerator boasts more than 21 cubic feet of storage space, while still only being counter depth – providing the ultimate in streamlined styling that’s perfect for a modern kitchen. 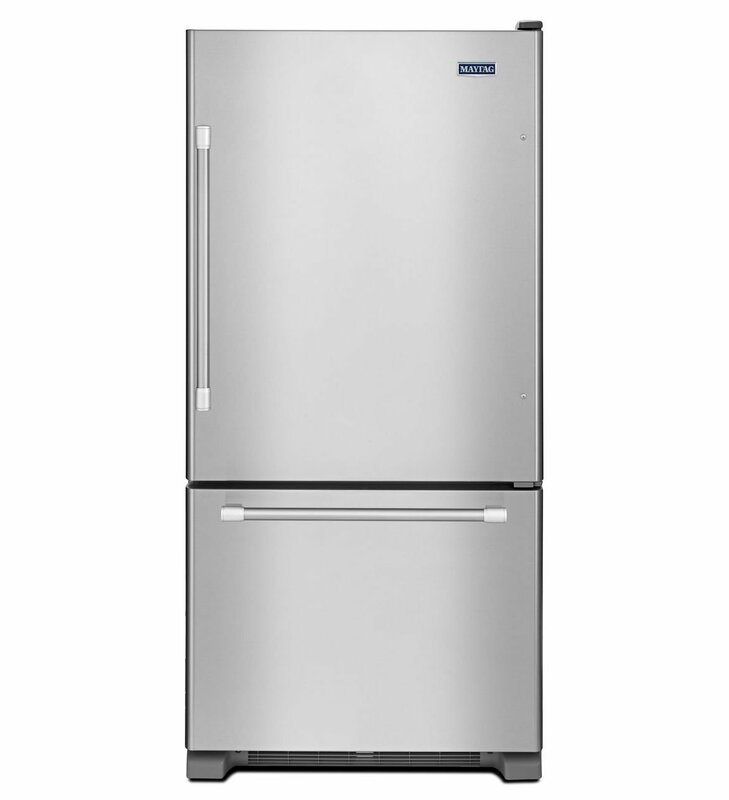 This Energy Star rated French door refrigerator features a generous 26 cubic foot capacity that can handle nearly anything your family can put in it and thanks to the brand’s Twin Cooling Plus system, it works to keep food fresher for longer. With 25 cubic feet of storage and a better-built compressor, this French door refrigerator will provide your family with many years of use. And thanks to the fact that it’s engineered and assembled in the USA, so you can trust the quality that goes into the workmanship. 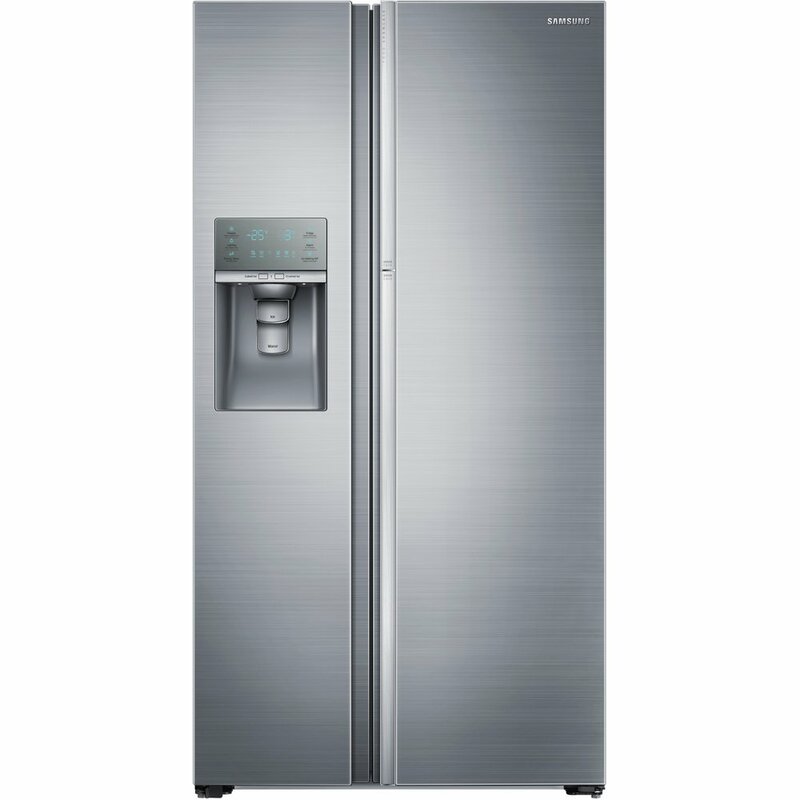 This bottom mount refrigerator boasts a load of smart features to help make your life easier including hands-free auto and precision fill from the water dispenser and an electronic temperature-controlled full-width drawer with colored LED lights.